1st Question: What in the name of all that is holy in this world is a Wooger Snatcher? It sounds like the stuff of childhood nightmares - not a kitchen utensil. "Watch out kids, or the Wooger Snatcher is going to get you!" Answer: A wooger is that stringy white thing attached to egg yolks. The Wham-O company thought there might be a market for a tool for getting rid of those things. They thought wrong. 2nd Question: What kind of insane cartoon mascot is this Mr. Hootie anyway? You mean to tell me that some marketing genius thought a good mascot for kitchenware would be a vile clawing freak? Alas. For this there is no answer. The whole ad is just disturbing! Kind of a unique angle to market kitchenware - the freakishly disturbing angle. 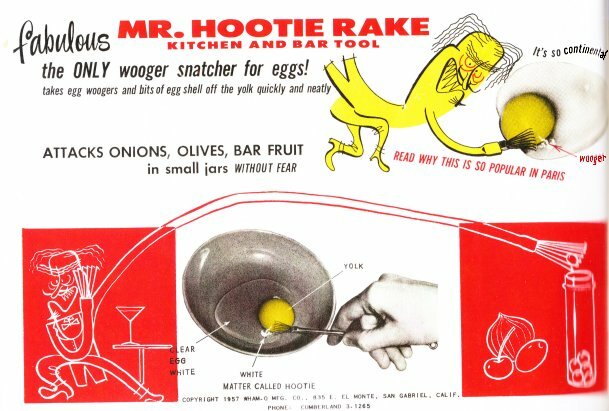 A hootie rake for a woogie snatcher? I don't think anything I can say would top that. I believe the proper term for "wooger" is chalaza, but wooger ain't half bad!